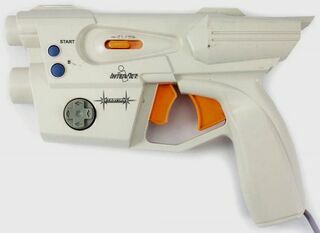 The StarFire LightBlaster is a third-party Sega Dreamcast light gun released by InterAct. The StarFire LightBlaster is one of the more common light guns, having seen a widespread release in North America and Europe. It has more functions than the standard Dreamcast Gun (or the officially endorsed Dream Blaster in North America), but is otherwise much the same product. In Japan the peripheral was released as the Rapid Gun Controller (ラピッド ガン コントローラー) and was distributed by Karat (although the InterAct prints remain on the gun itself).